Goodreads: Where do you go to relax when you’re the leader of the free world? Even the president needs to get away from it all sometimes. From George Washington to Barack Obama, each of our presidents has sought solace from the tightly structured daily routines of the White House. 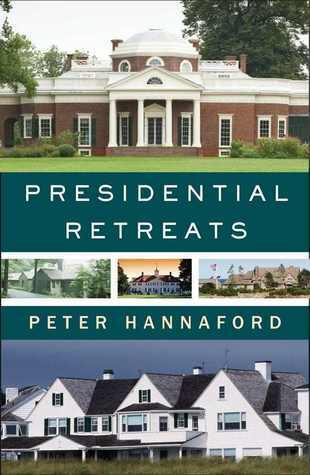 As Ronald Reagan once said of his California ranch, “I do some of my best thinking there.” Peter Hannaford takes readers on a fascinating armchair vacation with each of our leaders, offering unique historical context for the why and the where of their chosen retreats. Which president asked visiting foreign dignitaries to send him seeds to plant at his family home? Who called his vacation property “Sherwood Forest” because it was “a good place for an outlaw”? Which adventure-loving Commander-in- Chief set up a Summer White House in New York every year? Who liked to cruise aboard the presidential yacht when faced with momentous wartime decisions? Who polled the American people to help him decide where to vacation? Kritters Thoughts: Call me a dork - but every once in a while I love to read a little non fiction about presidents and history. Maybe it is because I live right next door to Washington, D.C. Or maybe because I like to think that the President and his family are regular people and have a story beyond the White House. This book fulfilled all my nerdy needs and at just the right time - middle of a crazy election season! A book that is centered around where the Presidents and their families vacationed, it was a different take on each President's history and what they each found important in regards to how to spend their "free" time. Each President received their own chapter that started with their childhood, then a background of the major decisions that were made while they were in office and then it ended with a description of the retreats that they made while they were in office and then where they spent their time after they left office. I absolutely loved this book. It was such a great take on the Presidents and so interesting to find out where each one found a break from their intense jobs. The inclusion of information on how to visit each retreat at the end of the chapter made a great piece of reference for me to want to hit some spots that are local for me. I would definitely recommend this book to those who enjoy reading about the Presidents and want a little more access to their life beyond the White House. Disclosure of Material Connection: I received one copy of this book free of charge from Simon and Schuster via Edelweiss. I was not required to write a positive review in exchange for receipt of the book; rather, the opinions expressed in this review are my own.